How much is your grocery bill each week? As you might has guessed, the average price for food has crept up a bit each year, with USDA-estimated costs for feeding your family at least a couple of dollars more each week than it was a couple of years ago. What about Naturally Non-Browning Apples? Have you heard about the newest darling of the fresh fruit world? We were treated with samples of Opal apples during a recent blogging conference. You’re a smart clean couponing shopper, so when at the grocery store, you start in the produce section, don’t you? That’s where you’re stocking up on a rainbow of nutrient dense fresh fruits and vegetables. You don’t need a traditional clipped coupon to find a fresh deal! Why not start by checking on the produce that’s been marked down the most? We recently found this bag of fresh looking oranges and this bag packed with nearly five pounds of bananas, marked down to just 99 cents each! The oranges are an easy go-to snack for the kids or an addition to a breakfast plate or dinner salad. To be sure we didn’t waste any of the overripe bananas, we started by peeling one bunch and placing chunky banana pieces into zipped bags. Then we stored them in compartments of a no-longer-used breastmilk storage container before placing them in the freezer. Some of the remaining bananas can be used in banana bread (that could in turn be frozen for later) or pudding, while most will be raw snack food. Have you ever asked the produce manager for a discount on fruits or vegetables that look like they should be in the markdown bin? Why not? Happy Clean Couponing! *This is a sponsored post for Mighty Nest that may contain affiliate links, in order to help bring you quality content here at CleanCouponing.com. Don’t you love those cliches? They make sense for our homes today as much as they ever did. An organized home helps keep some sense of order and calm in the midst of these incredibly busy days that fill our lives! Planning ahead is a good thing, as is being frugal. No wonder I found three opened boxes of pasta in the pantry during my year-end pantry cleaning. The shelves had gotten so disorganized during the holiday rush that I’d reached for a new package again and again, not realizing what we had. A bag of nuts had to be thrown away because we hadn’t stored them properly. Because #CleanCouponing means being frugal with more than money, we’re looking at ways to save time, energy and other valuable resources with the household choices we make. This story is too good not to share! I am not an extreme couponer. But from time to time, the savings on wholesome food can be so good, I have to tell you about it. I wish I could tell you clean couponing was always this easy or impressive. These results are not typical. But a few times per year, clean couponing pays me back. 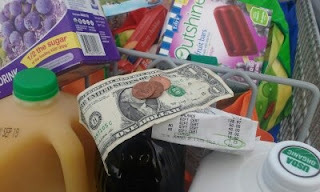 On this shopping trip I did not pay a cent, but instead was paid $1.03 from the store. My cart was full of 60 different food items. These were the most wholesome versions I could find of somewhat processed items like crackers and frozen fruit bars, many simple foods like fresh organic apples and frozen vegetables, sprouted grain tortillas, even organic milk. It was supposed to be $166.07 worth of groceries. I did not have to pay anything. I printed coupons from the Rock the Lunch Box website for some items. My moderate approach to being frugal with money, time, health and more means that I don’t always seek out super-low-priced deals. But this shopping trip to the grocery store was super-frugal and in line with other family values.